Happy Christmas to all our family and friends! Wes is still working at Edge Media. This summer they wrapped up the editing and production of an English as a Foreign Language production titled Backpack that will be used with textbooks that will teach children in South America and Korea to speak English. Lately, he has been designing web sites. You can see the one he designed for his work www.edgesc.com. Sarah is working for a marketing company called Mass Media Marketing. She is the assistant to the owner and also does some �graphic design� for them on the side. She enjoys the work and finds it VERY challenging. Making clients happy can be stressful at times, but she has learned so much in the 4 months she has been working there. We have also been working hard on the house. We really have done a lot to the guest bedrooms and the kitchen. We are also hoping to finish reupholstering a couch pretty soon. And then there�s the raking� it seems like it will NEVER end. That�s about it for our Christmas letter. 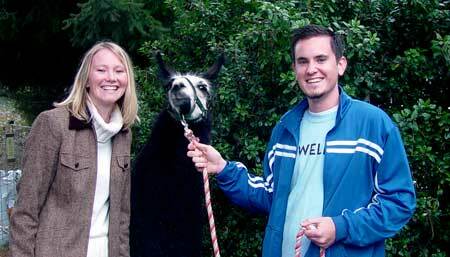 If you are wondering about the picture, we didn�t have a pet of our own, so we borrowed Tina from our friend, Napoleon Dynamite.